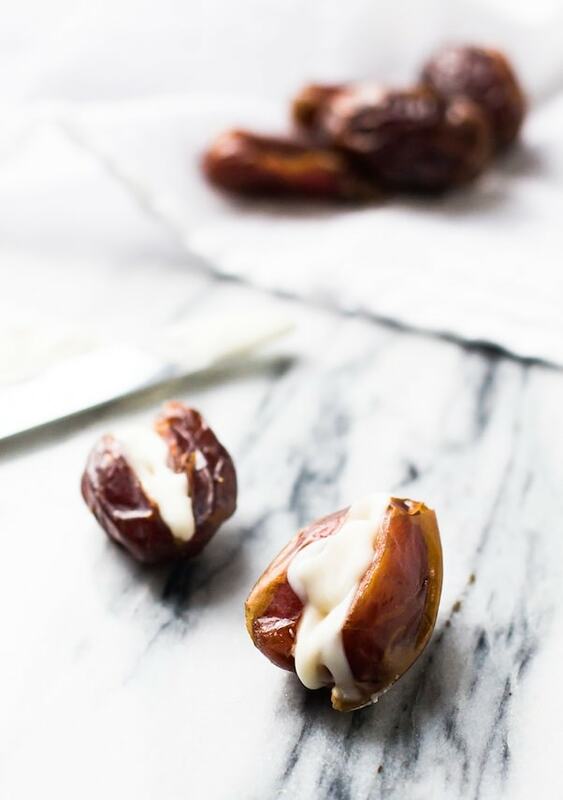 Whether you’re looking for an AIP treat or something easy to satisfy your sweet tooth, Coconut Butter Stuffed Dates are THE answer. They are truly “real food” decadence. Imagine a chewy coconut caramel that melts in your mouth, yet its made from just two ingredients that are literally the salt of the earth. These little gems have been my saving grace, along with avocados, squash, garlic and sweet potatoes during my Autoimmune Protocol healing journey. Have you tried coconut butter? It’s kind of like nut butter, and you can buy it at Whole Foods/natural grocery stores or make your own. It’s made from 1 thing: dried coconut flesh that’s pureed until silky smooth, so you’re getting the meat and healthy fats (whereas coconut oil is just the fat). Coconut is an extremely power healing ingredient, boosting the immune system and acting as an antibiotic, antiviral, antibacterial, antifungal and antimicrobial. As I was enjoying dates stuffed with coconut butter for dessert, it reminded me that it’s been 21 days since I had my last bite of refined sugar. (I can have honey & maple syrup, which are unrefined, but in small amounts because any type of sugar will feed bacteria. It also needs to be metabolized by my liver, which isn’t working correctly right now.) It was a piece of Dove dark chocolate, and I nearly cried throwing the wrapper away, but I swore instead. If you would have told me that I was going to be able to survive without chocolate (and coffee), I would have said there’s no way. Plus, baking and sharing my best GF Chocolate Chip Cookies with others is one of my nurturing traits. It’s given me such incredible insight to the effect sugar has on our brain – our thoughts, emotions and sense of taste. For the first few days of AIP, my brain was totally preoccupied fighting the horrible sickness of the bad bacteria dying off, no longer being fed by sugar and starches. That was fascinating in itself. I couldn’t even think about a sugar craving. After I recovered, my brain knew something was off. I walked through the skyway and all I could think about were the smells of what I wanted — caramel popcorn, fresh baked cookies, donuts, you name it. Things I eat so seldom, yet my brain was telling me I needed them more than anything. But maybe if I just snuck a bit of chocolate everything would be better…. And in that moment I realized the incredible psychological power that sugar has. I also realized that our brains love the sugar in things that are whole foods too, like gluten-free grains or other sources of carbohydrates. The crazy thing was that only lasted about two days, thank god. Another lesson there – our body listens and reacts faster than I imagined. The cravings decreased, and I fell in love with my stuffed dates. And something else happened – I started to taste the natural sweetness in all foods, not just the ones that we traditionally think of like sweet potatoes, parsnips and oats. I’ll never forget standing in the kitchen, hungry as all get out and taking a bite of plain celery. It tasted sweet and grassy. The same thing happened when I ate a piece of butter lettuce. Or the richness of homemade chicken bone broth. Those are characteristics I had totally missed, mostly because our palates have become muted. Talk about another blessing in disguise from this journey to heal my gut. That, along with discovering new foods and ways to achieve delicious flavor are giving me so much enjoyment. They’re what cheer me on when I have a sick day and I want to let go. Thanks for listening, and if you have any thoughts on your experiences, I’d love to hear them. Know that coconut butter is like coconut oil in that it will solidify at cooler temperatures. You can warm it up so it’s more spreadable and pour it into the cavity of the dates, or just scoop some of it out and press into the dates. I like both. 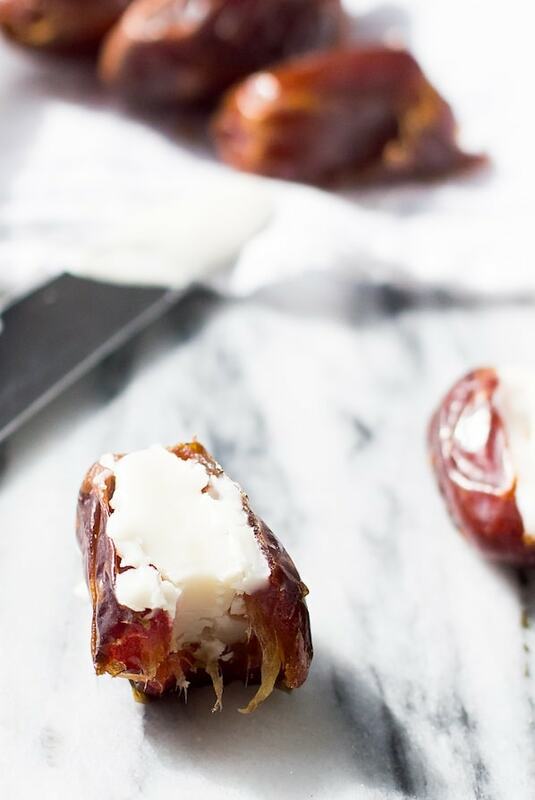 Make sure you use fresh dates, and at room temperature I think their texture is best. My favorite brand of cocnut butter is Nutiva, which you can buy at Whole Foods or any coop/natural foods store. Or you can make your own with Charlotte’s recipe! Thank you for making Heartbeet Kitchen possible! To help me pay for my domain, hosting, and enormous grocery bill, this blog is supported through the use of affiliate links. This means that I will earn a commission if you make a purchase through one of these links. Another reason I include them is because I get a lot of questions about the exact brand, etc. of what I’m using in my kitchen. This post is linked to the Paleo AIP Recipe Roundtable. Amanda, I’m going to have to look for coconut butter next time I’m at the health food store. I’m trying really hard to avoid sugar as well, due to a health issue. These sound great! It’s actually pretty easy to make yourself. You need to use unsweetened coconut and have a good food processor. It takes a while but it is so good. Hi Becki! 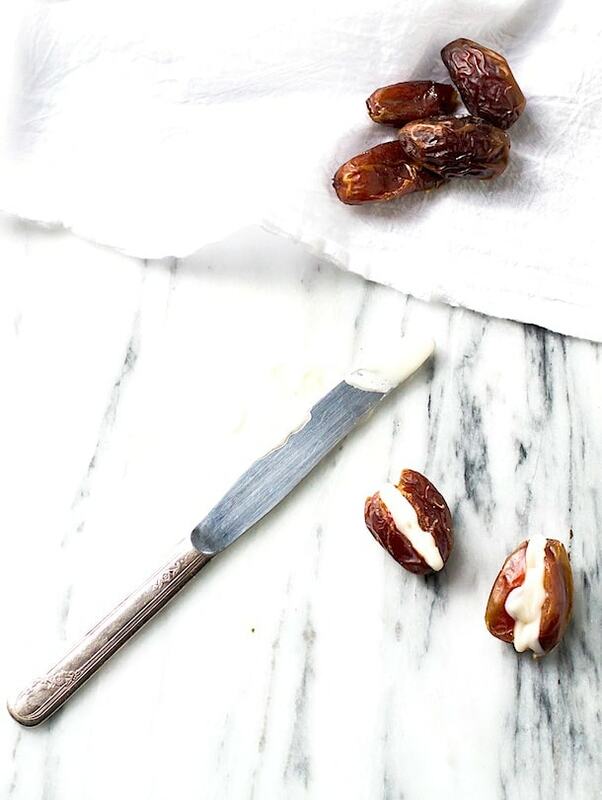 Dates are nature’s best hidden gem aren’t they? I love your version of date balls, they’d be a good snack for travel! Thanks for stopping by, xo. Hi Amanda, I’ve been reading your posts on FB and instagram off and on and am very intrigued! Your recipes look great, and I am having a lot of issues with my stomach and colon and still have not found the reason. I take a lot of pain meds, which I suspect contributes to bacteria growth, so this diet makes sense to me. I am petrified to try it because i think I will fail, also, I work full time and feel I don’t have the time and energy to devote to it. I don’t know what to do. I admire you so much! I wanted to ask you if you had issues with your gallbladder? Hi Sharon! Thanks so much for stopping by. Health issues can be so tough, and I definitely think taking all of the pain medications may be leading to why you aren’t feeling well. The medications actually kill the good bacteria in our guts, letting the bad survive (which are then fed by what we’re eating) and we start producing less and less stomach acid to help us digest. I talk a little more extensively about the science behind leaky gut in this post http://heartbeetkitchen.com/2015/recipes/soothing-turmeric-milk/, which may help. I haven’t had any issues with my gallbadder. I hope you find some answers! Good for you on holding up through your AIP diet. It’s amazing how your test buds and body adapt slowly over time. I used to crave a sprinkle of vanilla sugar on my cappuccino every morning, and when I first vowed to cut it out I couldn’t stand the taste of the coffee without it. And then slowly I got used to it and eventually I didn’t crave it at all. Now to do something about the coffee :-). We’ve been cutting back on sugar a lot recently for various reasons and I can absolutely relate to this post + how quickly our bodies seem to adjust if you can break that psychological hold that sugar can have on us so that you can really appreciate the natural sweetness of so many foods. These little treats seem like just the thing to satisfy one of those sugar cravings. Amanda! This looks delicious! 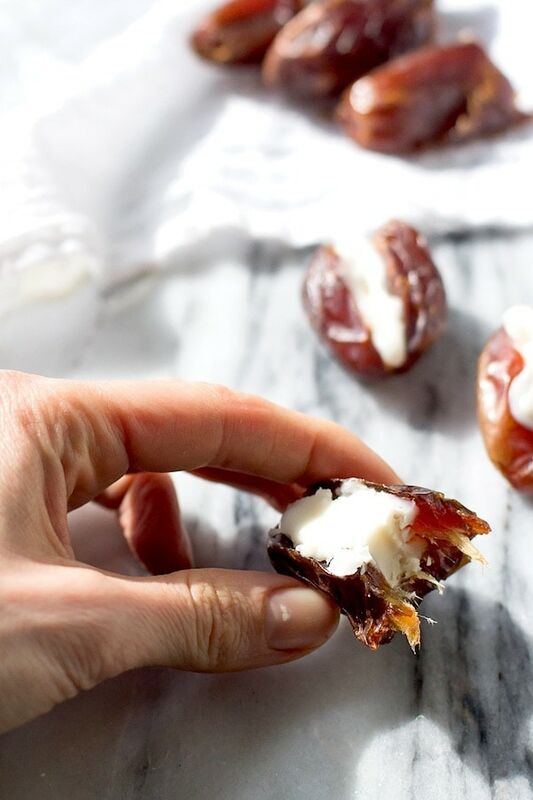 I recently just got into using dates (although mine are stuffed with cheese and wrapped in bacon), but I love the taste of coconut so i’ll have to try these. Never really heard about coconut butter – more so the oil, but this recipe goes on my shopping list for my next trip! Thanks for sharing! These sound fantastic and their simplicity makes it all the better! Unless I’m baking with an unrefined natural sweetener, I have pretty much cut out sugar for the most part and can tell such a difference (especially in those instances that I cheat!). I’ve always been fascinated with its effects on our bodies, aging, skin, etc. So glad you posted this. My mom used to stuff dates with walnuts for a sweet treat, I bet with the coconut butter it would be even tastier! I love the sound of this healthy treat! Just today, in fact, learned to make coconut butter. Yum! Hi Amanda! I was just imagining this combo the other day, sounds So amazing! Dates are not my favorite thing. However, I had dates wrapped in bacon and it was the most amazing thing ever. Wrap them up, bake them in the oven until crispy, and enjoy. love that you tried something new! 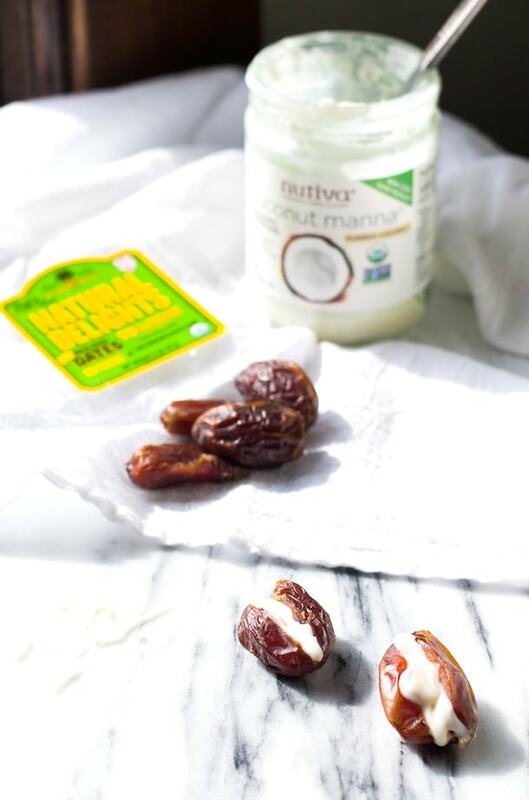 Thanks for sharing these great treats using coconut butter! It is definitely crazy what an effect sugar has on our brain. Such a perfect little treat! I’m loving the sneak peeks into your journey to healing. 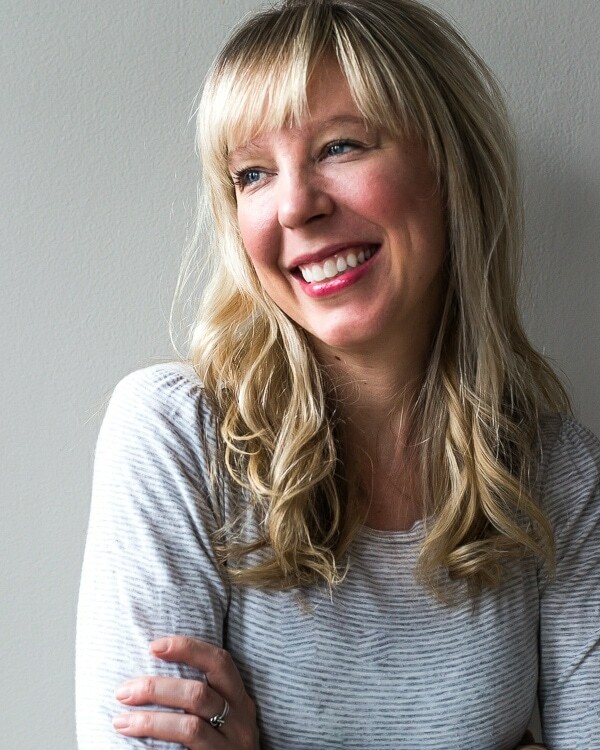 Every year, I do Kris Carr’s cleanse and wipe out refined sugars from my diet for three weeks. I always feel so much better and wonder why I don’t just make it a habit. There’s always this year ;-). Also, I’m eating tons of dates right now (rumor has it they help with labor) and I can’t WAIT to stuff them with coconut butter!!! Two of my favorite things in the world together in one snack? I am in! What a perfect little snack/dessert! I’ve been really into dried figs smothered in homemade maple pecan butter lately, but I’m going to have to change things up and try this. I LOVE dates! ooo… figs! so good too. i just bought an organic bag of dried figs at Costco. Now you’ve got me thinking about how I could use them! I love this, Amanda. I stuff my dates with all kinds of things, but never thought to use coconut butter. I can relate to the quitting refined sugars feeling. It’s honestly not as bad as one would think. There are so many options and amazing foods and natural sweets out there — just need to think outside the box a little, and go “unconventional” ;) It really made me appreciate the beauty and simplicity in food. Yes, it truly does make you appreciate all the nuances & flavors of what you’re eating. And it’s amazing how sweet things taste to me now. Eating a whole apple is similar in sweetness now to an ice cream cone. Oh WHY have I not thought of THIS before?! I love dates wrapped in prosciutto (I also love dried apricots in prosciutto too, if you’re looking for a sweet and salty hit!) and I have a freshly made batch of coconut butter on my counter!! Gonna’ lose the prosciutto tonight and then guess what I’m making for dessert? I find the simplest pairings to be the most satisfying. Thank you for this!! so now i want to try the dried apricots in prosciutto – yum. hope you enjoy these for dessert! Perfect timing! I am so sick from poor eating the last couple of weeks. I was sugar/grain free for months, and somehow I ended up back on(?) I know, I know, it’s ALWAYS that first bite that hooks me. I’m beginning again today to reclaim my health and get back into healthy eating. Thank you for sharing the date recipe, can’t wait to try it. Have you ever read the book “Sugar Blues?” Refined sugar was at one time banned in China as a drug. It’s definitely addictive. I cut way back on sugar years ago, but every now and then I have a little “binge,” and the addiction cravings start IMMEDIATELY. I’ll find myself going crazy if I have nothing sweet in the house. I even got addicted to fruit trying to stay away from refined sugar and gained 10 lbs.! I haven’t tried the AIP diet, but I’m looking into it for my lupus. I did not fully realize the grip sugar had on me until I went off of it for several days. It was one of many steps to get healthier and I know I couldn’t slim down while I was always seeking a treat. After I gave up all refined sugar I knew that I used to actually feel a sense of regret if I missed out on a cookie, even for days afterwards. I replaced the want of sugar with fruit for a couple weeks. I know that all sugar has an effect on your brain but nothing like refined sugar does. Now I am watching all carbs because I know that grains etc have an effect also, albeit not on the same level. My taste has changed so much since then. Sweet potatoes actually taste sweet to me and I even know when I have to quit eating it because it gets to be too much. Still don’t like butternut squash but other veggies that I shied away from are much more appealing to me. yes, i found it fascinating how much sweeter things seem to me now! sending you love and healing! I recently gave up sugar and potatoes and all grains that I am allergic too: wheat, rye, oats, barley, and soy. I found that eating legumes as soup totally alleviated any carb cravings. I have not craved any sweets, no pasta, bread, chips, or baked goods. I make my bean soups from scratch where I can totally control the ingredients. I have lost 13 pounds, have more energy, and am more alert. I do not ever plan on going back to those harmful foods. This will be a great treat when I lose the rest of my weight and get my gut healthy again. Good luck to all and keep pluggin’ away. Reading this nodding my head up and down saying “yup yup” exactly how I felt the first few days and then it DID get easy and I DON’T crave that stuff anymore (except on rare occasion) and food does have so much more flavor. Plus started craving new healthy foods I never had liked or even tried before! Been gluten free sugar free for 6 months now and my liver and skin has seen huge improvement…not to mention 15 lbs lighter (plus excercise) thanks for sharing! I’m not AIP, but I’ve been varying degrees of sugar-free for several years, and completely sugar-free for seven months. The other thing that happens when your taste buds adjust is that traditional sweets taste *nasty*! I sampled a cookie my husband was raving about at a party, and I spit it out because it was so disgustingly sweet! That also makes it easier to give up the things you thought you couldn’t live with. Hi! These look delicious. If you haven’t already tried dates with peanut butter, it’s another great combination. It was always our favourite as kids. Amanda, I just came across this on Pinterest. I am going shopping right now to look for some coconut butter. Sound scrumptious! Have you tried organic dried mango with cashew butter? It is amazing! hello, I have had severe rheumatoid arthritis for many years. My husband died suddenly and I found myself alone to raise my 15 year old son. Prednisone and methotrexate was my lethal morning cocktail . I was very sick. I quit all processed foods, sugar and gluten, I have lost 80 pounds and walk 5 miles a day. I hike in our local mountains. My diet changes have given me a new life! OH my sweet addiction! How many different words can I find to describe how delicious these little gems are? I stumbled upon this post through Pinterest (where else these days?) and went, hmmm, I have dates in the pantry and an unopened tub of coconut butter that’s been sitting in the fridge for ages. I put them together exactly like yours. I popped one in my mouth. You have changed my world. Hope your body has healed and you are feeling well. Hi Vanessa! I did not have candida, but it was SIBO, which the treatment is similar for in that you need to starve the bad bacteria. So while I was treating that, I didn’t eat dates, and one month after. Now it is okay for me though! You should know that I’ve pinned this, the title alone is so inspiring to me!! I have dsyautonomia, and I’ve been told cutting sugar will really help alleviate symptoms. It’s tough though! Major sweet tooth here. I take Plexus Slim which has definitely helped give me a healthier gut, it’s a journey. Anyway, just wanted to say thanks! Hello! I just watched recently the Australian movie “sugar film” and decreased my quantity of refined sugar as much as possible. The funny thing: the first ten days I felt super super tired as a reaction of my body and my brain I guess, but I didn’t feel hungry at all since I was eating some healthy fats instead (avocado, nut butter, etc.). Now after 3 weeks I just feel fine and energized and don’t have any cravings. I can sweeten my food a little bit with dates, banana or a little bit of maple/agave syrup and it’s fine. Need to try your recipe, looks awesome! Thank you for a great article! it certainly can be a change, but it’s so good to be aware of how our body reacts to things like sugar, or caffeine. i’m glad you are feeling well! and i’ll have to check out that movie. I bought the stuff to make these today for the first time and I promptly ate 3. WOW!!! These are so super-duper delicious I am dying over here. Thank you!! !